Enjoy some Spanish flair first thing in the morning with our Migas recipe. 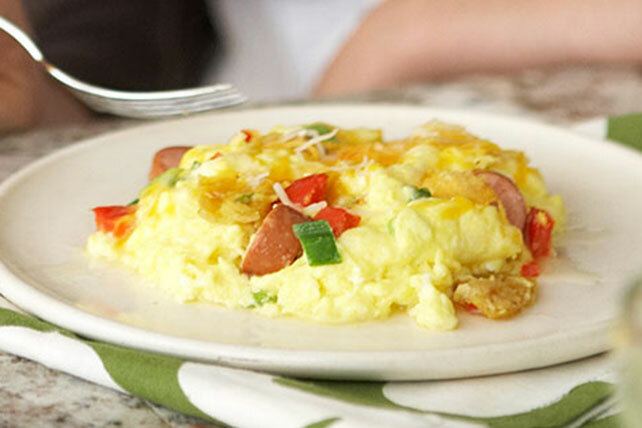 This version of Migas includes peppers, onions, wieners and shredded cheese. Heat oil in medium skillet on medium-high heat. Chop pepper and onions; cut wieners into 1/2-inch-thick slices. Add vegetables and wieners to skillet; cook 2 min. or until peppers are crisp-tender. Stir in tostadas; cook 1 min. or until slightly softened, stirring occasionally. Whisk eggs until well blended. Add to skillet; cook 3 min. or until almost set, stirring occasionally. Top with cheese; cover. Cook 1 min. or until melted. Serve with a crisp, mixed green salad tossed with your favorite KRAFT Light Dressing. Substitute tortilla chips for the tostadas.